Milk pitcher? It would flow in the opposite direction with my cats! That’s a licorice liquor, right? And yep, wouldn’t travel well the way I pack! Never would have thought of that one. And I read that it was coming.I share your qualms. But how interesting that hey have special pitchers. Quite a collector’s item. 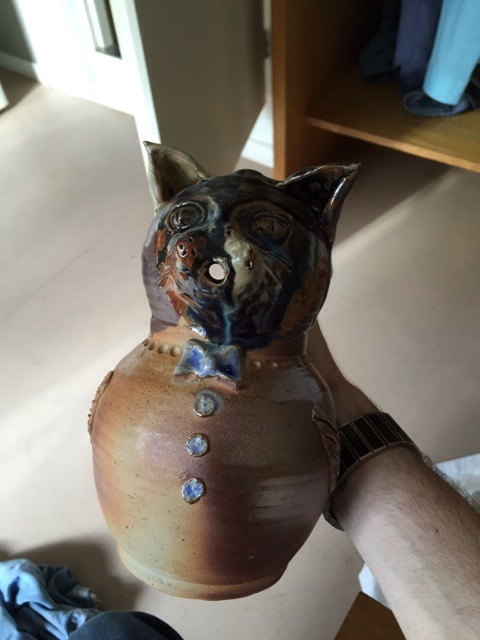 Not sure what the purpose of it is, but it’s some sort of ceramic or clay cat. Iâm afraid it wonât make it home in one piece the way they toss around luggage. LOL- yeah, it will be empty and heâs said heâs going to wrap it well with his clothes. I hope It makes it.